Across the country, a vigorous debate is taking place in federal and state courthouses about how privacy protections should apply to modern technologies. One of the most spirited issues in this debate is whether the Fourth Amendment requires law enforcement to get a warrant to track a person’s location via their cell phone. This week EFF filed two new amicus briefs that answer that question with a resounding yes. Last month, the United States Court of Appeals for the Eleventh Circuit issued a disappointing decision in United States v. Davis, finding that because people share cell site location information—the cell phone service provider’s record of which cell phone tower a customer connects to—with their phone company, they have no expectation of privacy over this information, and police don’t need a search warrant to get this sensitive location data. But, as we argue in our briefs, Davis is based on old cases considering analog-era technology and hardly settles the question. We filed our first amicus brief in a case in California federal court, where a magistrate judge denied a government request for historical cell site records and ordered the government to seek a search warrant for the information. The government appealed this order to U.S. District Judge Lucy Koh who requested the Federal Public Defender explain why, in light of Davis, a warrant was required. Both EFF and the ACLU of Northern California filed amicus briefs supporting the Federal Public Defender. Our brief explains that as an increasing number of state courts and legislatures adopt a warrant requirement for cell site records, the expectation that these records remain private is necessarily reasonable. That’s particularly true in California, where the state Supreme Court long ago rejected the so-called “third party doctrine,” the idea that you lose an expectation of privacy over records shared with a third party. The state high court also rejected the U.S. Supreme Court’s 1979 decision in Smith v. Maryland—which extended the doctrine to telephone records—and instead found the state constitution protected telephone records with an expectation of privacy. And the California legislature is currently considering legislation co-sponsored by EFF, the ACLU of California and many technology companies, that would require police obtain a warrant to get location records and other kinds of digital data. Judge Koh’s decision to seek briefing is just the latest in a series of decisions from federal judges in Northern California grappling with these issues. In the summer of 2014, Magistrate Judge Nathanael Cousins also ordered the Federal Public Defender to brief whether a warrant was required to obtain cell site records, and EFF submitted an amicus brief in that case, arguing that the existence of state law protection for this information demonstrated that it was reasonable to treat it as private. In March, U.S. District Judge Susan Illston (the same judge who found the National Security Letter statute unconstitutional) issued an opinion finding an expectation of privacy in historical cell site information. Judge Illston’s reasoning was based in part on the argument we’ve made to Judge Cousins and Judge Koh: that as more people are being told by state courts and legislatures that they can expect telephone records and cell site information to remain private, this expectation becomes reasonable. In New York state court, EFF and the Brennan Center for Justice at New York University School of Law joined an amicus brief written by the New York Civil Liberties Union (NYCLU) that provides a stark visualization of why police should get a warrant to obtain cell site information. Police obtained more than six months of cell site information—more than 10,000 data points—on Ali Moalawi without a warrant. This data painted a vivid portrait of when and where he went, including when he was at home or spent the night somewhere else. 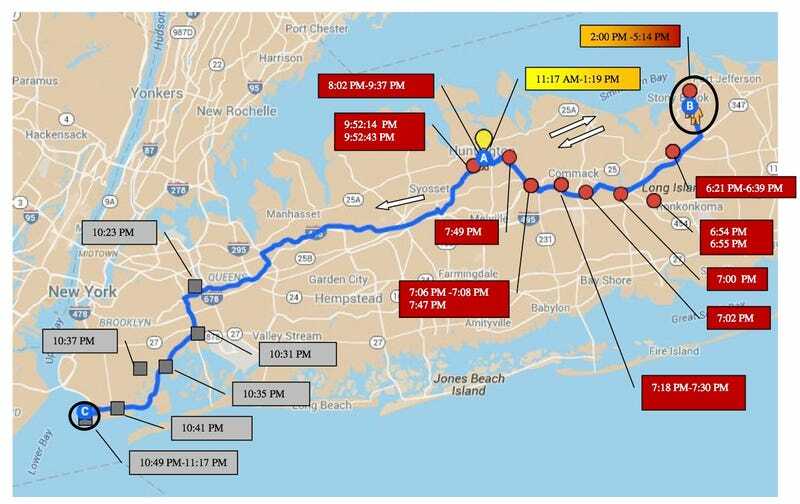 The NYCLU visualized these trips on a map, showing Moalawi’s cell site connection records on March 1, 2014, when Moalawi appeared to spend the morning at home before heading to the Bronx and then finally Brooklyn where he stayed until late in the evening. Charged with burglary, Moalawi moved to suppress the cell site information. Our amicus brief explains why under the New York state constitution, a warrant was required to access this sensitive information. In 2009, the New York Court of Appeals, the state’s highest court, issued an important decision in People v. Weaver, ruling that the use of a GPS device to track a car over an extended period of time triggered an expectation of privacy and required a warrant. Our brief explains why Weaver should apply to cell site location records too, regardless of the fact that the cell phone service providers hold the records. Given the ubiquity of cell phones and the fact people carry them almost everywhere they go—including inside a home—cell site information can be even more revealing than GPS information. The fact that reasonable judges can and do differ on whether a warrant is needed to obtain cell site records suggests the U.S. Supreme Court will ultimately have to step in and settle the issue. If it does get called to resolve this debate, the court has sent encouraging signs that it understands the fact that technological developments are changing the legal landscape. In Justice Sonia Sotomayor’s 2012 concurring opinion in United States v. Jones, a case involving GPS monitoring, she explicitly called out Smith, explaining “it may be necessary to reconsider the premise that an individual has no reasonable expectation of privacy in information voluntarily disclosed to third parties” because “this approach is ill suited to the digital age, in which people reveal a great deal of information about themselves to third parties in the course of carrying out mundane tasks.” Last summer in Riley v. California, the court cited favorably to Justice Sotomayor’s concurrence and ruled police could not search the data on a cell phone connected to a lawful arrest without a warrant, rejecting as “strained” the government’s attempt to analogize a cell phone to physical items. Even though Davis disregarded the Supreme Court’s approach to modern technology by relying on a case decided when Jimmy Carter was president, these federal and state courts on opposite ends of the country will have a chance to make their own assessment. They won’t be alone as other courts will ultimately have to confront the issue, too. Hopefully, they’ll recognize that our changing world requires legal analysis grounded in the present, not the past. This post was originally published by the Electronic Frontier Foundation and appears here under a Creative Commons Attribution License.